Game of Thrones S07E04 AAC-NoGRP. The fate of Jon Snow ends up being revealed. Daenerys meets a strong man. Cersei sees her daughter once again. 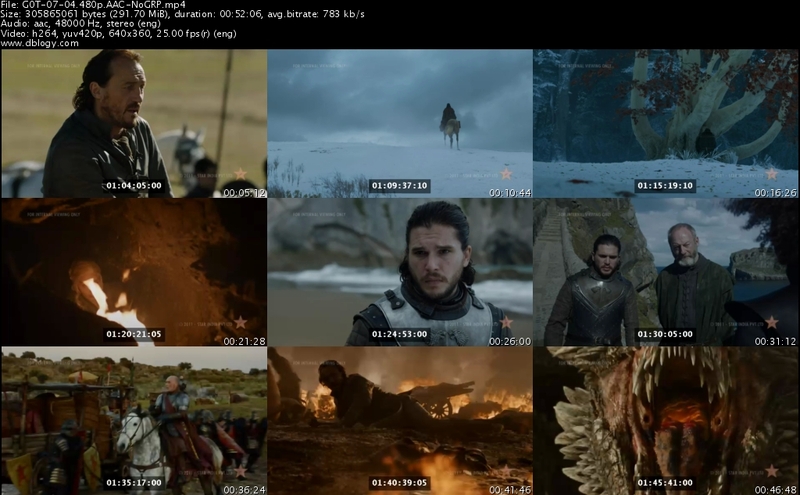 What does it take to put together ‘Game of Thrones’? Spend a day on the set with the people who make it happen. Season 4 Game of Thrones – Tyrion welcomes a guest to King’s Landing. At Castle Black, Jon Snow finds himself unwelcome. Dany is pointed to Meereen, the mother of all slave cities. Arya runs into an old friend. A Game of Thrones update includes interviews with the cast and crew; and clips from the series’ fourth season, which begins April 6. Jon meets the King-Beyond-the-Wall while his Night Watch Brothers flee south towards the Wall. In King’s Landing, Tyrion wants a reward, Cersei arranges a dinner party, and Littlefinger offers to help Sansa. Across the Narrow Sea, Dany starts her journey west while in the Riverlands, Arya meets a band of outlaws. A look back at the events from Season 2 of the hit HBO series Game of Thrones.